Zeppelin relies on its own first-class technology for rubber and tire plants. More than 500 systems that have been constructed around the world as well as a list of references with all the major companies from the industry also speak for themselves within this sector. The operating success of companies in the rubber and tire industry depends on the exact mixing of raw materials and the reliable and high-precision supply and dosing. A decisive factor is the mixing – a task that requires special technologies, know-how and most importantly experience. Zeppelin supplies complete plants from a single source from the receipt of raw materials and the storage and conveying technology, the weighing and dosing of carbon black, silica, oils as well as other additives and small components through to turn-key mixing rooms. Technical innovations, such as a patented slow conveying process for carbon black beads and silica that are considered a pioneering concept within the industry, underline the excellent reputation that Zeppelin enjoys within the rubber industry. Raw materials in powder form must be conveyed pneumatically in hermetically sealed systems in order to ensure that there is absolutely no dust in the system and surrounding area. The lowest possible conveying speed is a decisive factor for the product-friendly conveying of sensitive products, such as carbon black or silica. Very different qualities of carbon black and silica are used in modern rubber compounds. The conveying system must always be dust-free and work reliably and at a constant performance despite the different characteristics and flow properties of these raw materials. 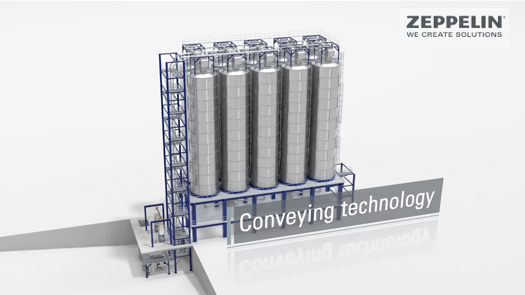 Our patented conveying processes ensure gentle and reliable conveying at all times.